Sandeep Pulusani won the WSOP $3,000 No Limit Hold’em Event 44 by overcoming a field of 1,072 players over the course of three days. 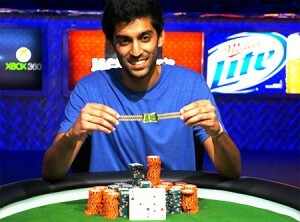 This is Pulusani’s first bracelet win and with it he took home $592,684 prize money. Pulusani beat a field of 1,072 players to claim $592,684 and his first bracelet. Earlier in the WSOP Pulusani came 12th in the $3k No Limit Hold’em – 6 Handed and won $15,509. His latest win brings his career earnings to an impressive $735,498. The $3,000 No Limit Hold’em event had a mixed field of amateurs and professionals and a prize pool worth $2,926,560. There were some notable names that cashed out including Randy Lew in 113th ($5,560), Lauren Kling in 112th ($5,560), Sorel Mizzi in 90th ($6,555), Faraz Jaka in 80th ($7,287), Barry Shulman in 63rd ($9,335), and Matt Marafioti in 23rd ($17,910). Pulusani went heads-up against Niall Farrell and at one point was trailing by 1.48m chips to Farrell’s 8.12m. However, Pulusani managed to claw his way back and eventually the final hand was won. Pulusani held A-3 and Farrell A-2, they went all in preflop, and after the board rolled out 3-7-5-9-A, Sandeep Pulusani was awarded the gold winner’s bracelet.